Enjoy staying close to North Hobart restaurants, state cinema, city and also Salamanca markets while also enjoying the peace and quite of this tranquil setting. With more than enough room to accomodate ten people with four large bedrooms with a queen with ensuite a double, three single bedroom and the option of a fourth bedroom down a small flight of internal stairs for guests with more than six people includes a double bed and fold out sofa bed. The large main bathroom which includes a separate shower and a spa bath to relax in after a long day sightseeing, the kitchen is modern with everything needed to cook, with a open plan dining and large lounge room which includes four couches and a large t.v, there is a deck off the dinning, the house is heated with a reverse cycle heat pump in the lounge room and for the cold tassie night a extra electric heater in the hallway to heat up the bedrooms, u will have total access to the whole top floor of this home. 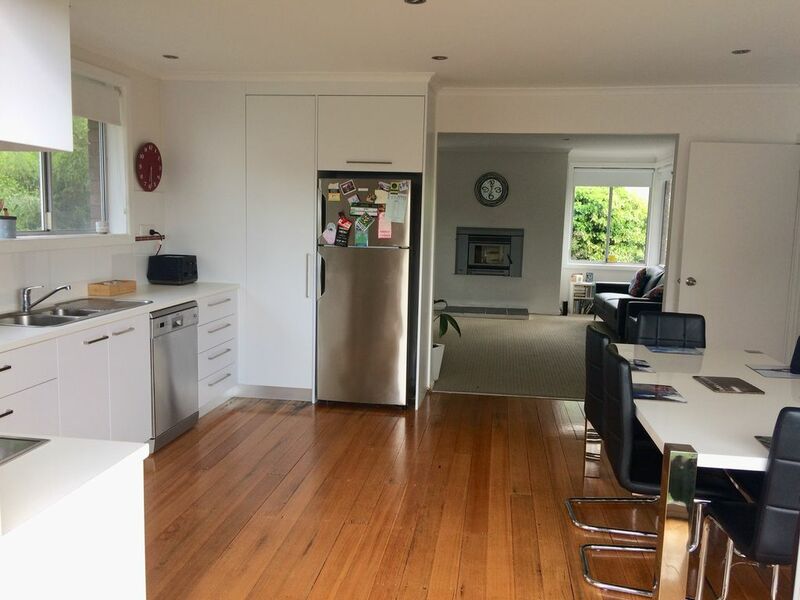 This home is located in one of hobarts most popular suburbs, west Hobart, hill street grocer is located 500m from the home another 200m away u will find smolt kitchen, Adams store, a butcher, chemist and doctor, another 500m away is Lansdowne cafe and paesano pizza and pasta restaurant. 35-45 minutes walk or 10 minute drive to salamanca markets, restaurants and bars. There is a bus stop located less than 5 minutes walk away. Great views from the back deck. We were traveling in a group consisting of 4 couples. We found this property to be very comfortable, airy, well stocked and only a short taxi ride from Salamanca. Thank you Shelley. We all enjoyed staying here very much indeed. The house had everything we needed and Shelley was the perfect host. Thank you! This house had everything we needed for a relaxing holiday with the whole family. Shelly is a super host who made sure we were well looked after the whole time. I expect we'll be back regularly! It is a well maintained property. We enjoyed our time there. Located on the top of a steep hill. Very spacious and equipped. Shelley is extremely friendly & helpful. Great place for large families. A large family home that was well equipped with everything you need. Very good kitchen with all of the little things like peelers, salad bowls, chopping boards, salt, pepper, oil, cling wrap etc. It made it very easy to cook meals. A large dining table and living area to spend time with the family. The house was very clean and had a large family bathroom as well as an ensuite. Probably not the best choice for elderly due to steep stairs leading to property, but a great place to stay for families. Only 5 minutes to the city and a nice grocery store within walking distance. We had a lovely time here.